Introduction: Type 2 diabetes mellitus (T2DM) iscurrently one of the most common diseases as a result of obesity and aging. Currently, T2DMis treated by various methods, such as insulin injection and glucose regulation agents. In this report, we report the case of a T2DM patient who was successfully treated by autologous bone marrow-derived stem cell transplantation. Methods: The patient was diagnosed with T2DM by standard methods for more than ten years. The patient agreed to be treated by the new approach – autologous bone marrow-derived stem cell transplantation. The bone marrow was collected from the patient twice at 100 mL volume each time. The stem cellenriched mononuclear cells (MNCs) in the bone marrow were isolated by gradient centrifugation. MNCs were intravenously transfused into the patient twice within the 1-month interval. The lasting glucose and 2h-after meal glucose, as well as hemoglobin A1c (Hab1c), were recorded before transplantation, and 1-, 3-, and 6-months post-transplantation. Results: The results showed that there were no adverse effect recorded during the monitoring period, and that the T2DM symptoms significantly improved. After the first round of transplantation, the glucose level reduced considerably and continued to decrease out to 3 months. Meanwhile, after 2 months of transplantation, the Hab1C level decreased and achieved the average level at the 3rd month of treatment. After 6 months, the patient was free from insulin injection and maintained glucose and Hab1c level. To date, after 9 months of treatment; the patients has continued to be free from insulin injection and without any adverse effects. Conclusion: The primary results have suggested that autologous bone marrow-derived stem cell transplantation may be a new direction for T2DM treatment. Type 2 diabetes mellitus (T2DM) is among the most common disease nowadays. As obesity and aging continue to rise, T2DM has also significantly increased over recent years 1,2,3. The most significant complications of T2DM are high mortality rates and low quality of life 4,5,6. The mechanism of T2DM are quite complex but relate to insulin resistance in patients 7,8,9. Some reports have suggested that T2DM patients can produce insulin, though the insulin does not function adequately in those patients 10,11,12. Recently, various efforts have been made to investigate the treatment of T2DM via use of stem cell transplantation 13,14, and exosome transplantation 15. In this report, we present a case of a T2DM patient who was successfully treated by autologous bone marrow-derived stem cell transplantation. This case report involved a 55-year old female patient bearing T2DM for ten years. The family medical history showed that the patient had three daughters with T2DM. The medical evaluation for the patient indicated that the fasting glucose was 7.27 mg/dL, and that at 2h after meal, the glucose level was at 16.91 mg/dL. Her hemoglobin A1c (HbA1c) level was 7.9%. To control the glucose level, the patient was treated with Lantus 14UI via underskin injection in the morning each day, and took one Diamicron (60 mg) tablet in the morning each day, as well as one Janumet (1000/500 mg) tablet in the morning each day. The patient completed a consent form, agreeing to participate in the study and to be treated by autologous bone marrow-derived stem cell transplantation. All protocols and manipulations used in this case were approved by the local ethical committee. All protocols and kits used in this study were transferred and received from the Stem Cell Institute (University of Science, Vietnam National University-Ho Chi Minh City, Viet Nam). Bone marrow was collected from the patient at 100 mL each time for a total of two times within a 1-month interval. The bone marrow-derived stem cell preparation was isolated using the MNC Extraction Kit, according to the manufacturer’s guidelines. Firstly, 30 mL bone marrow was diluted with 10 mL Dilute Medium (Bottle 1). Then the diluted blood was placed over 10 mL separation medium (Bottle 2) in another 50 mL centrifuge tube. This tube was centrifuged in a swing rotor centrifuge machine at 400 g for 30 min, 18-20 oC. After centrifugation, the interphase layer containing the stem cells was collected into a 15-mL centrifuge tube. In the next step, the stem cells enrichment process took place. The fraction was cleaned using the Clean-up medium (Bottle 3) by centrifugation of the tube with Clean-up medium at a ratio of 1:1 (interphase solution: clean-up medium) at 400 g for 5 min. Finally, this fraction was washed (using washing buffer (Bottle 4)) to remove all solutions in the previous steps. After this step, the stem cell-enriched fraction was the white pellet at the bottom of the centrifuge tube. The patient was transplanted with MNCs twice, with the second transplant occurring 1 month after the first. At each timepoint, the patient was intravenously transplanted with all isolated MNCs from 100 mL of the bone marrow in 250 mL saline over 45 min. The patient was monitored for fasting blood glucose, blood glucose 2 hours after meals, and HbA1c level before transplantation and at 1-, 3-, and 6-months post-transplantation. All assays were performed according to the routine medical evaluations at the hospital. The patient continued to use the same drugs as before the transplantation until the medical doctors changed the doses. Compared to “before transplantation”, after 1 month of transplantation with drug treatment, the fasting blood glucose and HbA1c level slightly changed from 7.27 mg/dL to 7.05 mg/dL, and 7.9% to 8.0 %, respectively. The blood glucose level at 2 h after meal was strongly reduced from 16.91 mg/dL to 11.93 mg/dL. However, compared to “before transplantation”, at 3 months post-transplantation, all 3 indicators (fasting blood glucose, blood glucose 2 hours after meal, and HbA1c levels) were significantly decreased. The values changed from 7.27 mg/dL to 5.88 mg/dL (for fasting blood glucose), 16.91 mg/dL to 9.79 mg/dL (for lood glucose 2 hours after meal), and from 7.9% to 7.0% (for HbA1c level). At this time, the medical doctors reduced the insulin dose as well as other drugs for the patient. The patient took Lantus (12 IU), one tablet of Diamicron (30 mg) before a meal, and one tablet of Janumet (50/850 mg) after a meal. At 6 months post-transplantation, the fasting blood glucose levels were stable. The values were at 6.03 mg/dL (at the 6th month) compared to 5.88 mg/dL (at the 3rd month). Similarly, the 2h-after meal blood glucose was stable at 10.10 mg/dL (at the 6th month), compared to that at the 3rd month. The HbA1c level slightly decreased from 7.0 (at the 3rd month) to 6.8% (at the 6th month). 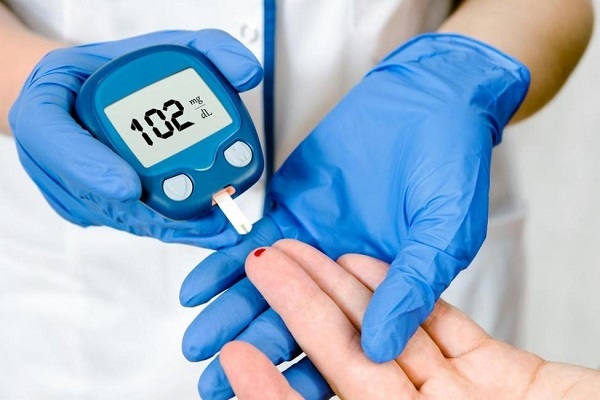 With the stability of glucose level, and HbA1c, at this time the patient terminated treatment by insulin; however, the patient continued to use one tablet of Janumet (1000/50 mg) per day as well as one tablet of Diamicron (30 mg) per day. During the 6 months of monitoring and treatment, there were no observed adverse effects related to the stem cell transplantation nor the bone marrow collection procedure. Type 2 diabete mellitus (T2DM) is a complex disease associated with different organs as well as the body system. Although the etiology of this disease is still under study, most scientists agree that T2DM is related to the resistance of insulin in muscle cells; briefly, insulin cannot trigger the glucose uptake process into cells 7,16. For the past decade of stem cell therapy, most studies have used stem cell therapy in type 1 diabetes mellitus to regenerate beta cells in the pancreas 17,18,19. In recent years, some studies have evaluated the use of stem cells to treat T2DM 14. In this study, we have reported a case of a T2DM patient whose diabetes symptoms improved after bone marrow-derived stem cell transplantation. The results clearly showed that the transplantation of bone marrow-derived stem cells significantly enhanced the symptoms of T2DM in the 3 parameters: fasting blood glucose, blood glucose 2 hours after meals, and HbA1c level. The concentration of glucose was strongly reduced after one month and continuously reduced over 6 months post transplantation. More importantly, HbA1c is a critical value to represent the efficacy of the therapy. Unlike glucose levels, HbA1c value usually decreases late. Indeed, in this case, at 1 month post-transplantation, the glucose level decreased although the HbA1c value did not change. These results reflect the natural law of recovery from diabetes mellitus. They also confirm that the decrease of glucose is due to the bone marrow-derived stem cell transplantation. This report did not address why or how bone marrow-derived stem cell transplantation could improve T2DM. However, we suggest some hypotheses for some mechanisms which led to improvement of T2DM symptoms. The bone marrow-derived stem cells are a combo of various kinds of stem cells, including mesenchymal stem cells 20, hematopoietic stem cells (HSCs) 21, endothelial progenitor cells 22, and embryonic-like stem cells 23. These stem cells can display different bioactivities when transfused into peripheral blood. However, according to our opinion, the primary role in the improvement relates to MSCs. Indeed, MSCs have been shown to have at least three mechanisms that may be useful in T2DM treatment. Firstly, the MSCs can act as immune modulation factors 24. In this mechanism, MSCs can decrease the local inflammation at muscles to help reduce the insulin resistance. Some studies have shown that T2DM was related to some inflammation reactions, which caused insulin resistance 25,26. Secondly, MSCs can produce a pool of cytokines and growth factors to stimulate the endogenous stem cells to undergo self-renewal and maintain tissue homeostasis 27,28. These cytokines and growth factors also reduce apoptosis of injured cells which help to reduce the complaints of T2DM. Thirdly, in autologous transplantation, MSCs can migrate to some injured tissues and differentiate into tissue-specific cells to heal and recover tissue functions, especially the injured tissues per complaints of T2DM patients. This report represented a case of a T2DM patient treated by autologous bone marrow-derived stem cell transplantation. The particular markers/indicators of T2DM include fasting blood glucose, lood glucose 2 hours after meal, and HbA1c level; all were significantly improved. At 6 months post transplantation, the patient was free from insulin injection. This case report suggests that bone marrow-derived stem cell transplantation may be an effective therapy for T2DM. However, controlled clinical trials should be conducted to comprehensively evaluate the efficacy as well as the side effects of this therapy. Le Thi Bich Phuong and Phan Kim Ngoc were the principal investigators. Le Thi Bich Phuong and Nguyen Phu-Van Doan performed the clinical treatment and monitoring. Phan Van Tien and Dang Ngo Chau Hoang isolated the bone marrow derived stem cells; evaluated the cell quality before transplantation. Phuc Van Pham developed the technology used to isolate and purify the stem cells; analyzed the data, wrote the manuscript. All authors read and approved the final manuscript. Ingelsson E., McCarthy M.I.. Human Genetics of Obesity and Type 2 Diabetes Mellitus: Past, Present, and Future. Circ Genom Precis Med. 2018; 11 (6) : e002090 . Gunasekaran U., Gannon M.. Type 2 diabetes and the aging pancreatic beta cell. Aging (Albany NY). 2011; 3 (6) : 565-75 . Palmer A.K., Tchkonia T., LeBrasseur N.K., Chini E.N., Xu M., Kirkland J.L.. Cellular Senescence in Type 2 Diabetes: A Therapeutic Opportunity. Diabetes. 2015; 64 (7) : 2289-98 . Wolffenbuttel B.H.. Type 2 diabetes mellitus. Aspects of complications and treatment. Neth J Med. 1993; 43 (3-4) : 187-99 . Kumar A., Bharti S.K., Kumar A.. Type 2 Diabetes Mellitus: The Concerned Complications and Target Organs. Apollo Medicine. 2014; 11 (3) : 161-6 . Litwak L., Goh S.Y., Hussein Z., Malek R., Prusty V., Khamseh M.E.. Prevalence of diabetes complications in people with type 2 diabetes mellitus and its association with baseline characteristics in the multinational A1chieve study. Diabetol Metab Syndr. 2013; 5 (1) : 57 . Taylor R.. Insulin resistance and type 2 diabetes. Diabetes. 2012; 61 (4) : 778-9 . Olefsky J.M., Revers R.R., Prince M., Henry R.R., Garvey W.T., Scarlett J.A., others Insulin resistance in non-insulin dependent (type II) and insulin dependent (type I) diabetes mellitus. Adv Exp Med Biol. 1985; 189 : 176-205 . Reaven G.. Insulin resistance, type 2 diabetes mellitus, and cardiovascular disease: the end of the beginning. Circulation. 2005; 112 (20) : 3030-2 . Mudaliar S., Edelman S.V.. Insulin therapy in type 2 diabetes. Endocrinol Metab Clin North Am. 2001; 30 (4) : 935-82 . Wulffelé M.G., Kooy A., Lehert P., Bets D., Ogterop J.C., Borger van der Burg B., others Combination of insulin and metformin in the treatment of type 2 diabetes. Diabetes Care. 2002; 25 (12) : 2133-40 . Cho J., D'Antuono M., Glicksman M., Wang J., Jonklaas J.. A review of clinical trials: mesenchymal stem cell transplant therapy in type 1 and type 2 diabetes mellitus. Am J Stem Cells. 2018; 7 (4) : 82-93 . Pawitan J.A., Yang Z., Wu Y.N., Lee E.H.. Towards Standardized Stem Cell Therapy in Type 2 Diabetes Mellitus: A Systematic Review. Curr Stem Cell Res Ther. 2018; 13 (6) : 476-88 . Sun Y., Shi H., Yin S., Ji C., Zhang X., Zhang B., others Human Mesenchymal Stem Cell Derived Exosomes Alleviate Type 2 Diabetes Mellitus by Reversing Peripheral Insulin Resistance and Relieving β-Cell Destruction. ACS Nano. 2018; 12 (8) : 7613-28 . Phielix E., Mensink M.. Type 2 diabetes mellitus and skeletal muscle metabolic function. Physiol Behav. 2008; 94 (2) : 252-8 . Gu B., Miao H., Zhang J., Hu J., Zhou W., Gu W., others Clinical benefits of autologous haematopoietic stem cell transplantation in type 1 diabetes patients. Diabetes Metab. 2018; 44 (4) : 341-5 . Gan J., Wang Y., Zhou X.. Stem cell transplantation for the treatment of patients with type 1 diabetes mellitus: A meta-analysis. Exp Ther Med. 2018; 16 (6) : 4479-92 . Senior P.A., Pettus J.H.. Stem cell therapies for Type 1 diabetes: current status and proposed road map to guide successful clinical trials. Diabet Med. 2018 . Gardner O.F., Alini M., Stoddart M.J.. Mesenchymal Stem Cells Derived from Human Bone Marrow. Methods Mol Biol. 2015; 1340 : 41-52 . Ng Y.Y., Baert M.R., de Haas E.F., Pike-Overzet K., Staal F.J.. Isolation of human and mouse hematopoietic stem cells. Methods Mol Biol. 2009; 506 : 13-21 . Ii M.. Bone marrow-derived endothelial progenitor cells: isolation and characterization for myocardial repair. Methods Mol Biol. 2010; 660 : 9-27 . Guerin C.L., Loyer X., Vilar J., Cras A., Mirault T., Gaussem P., others Bone-marrow-derived very small embryonic-like stem cells in patients with critical leg ischaemia: evidence of vasculogenic potential. Thromb Haemost. 2015; 113 (5) : 1084-94 . Xia C., Rao X., Zhong J.. Role of T Lymphocytes in Type 2 Diabetes and Diabetes-Associated Inflammation. J Diabetes Res. 2017; 2017 : 6494795 . Perry B.D., Caldow M.K., Brennan-Speranza T.C., Sbaraglia M., Jerums G., Garnham A., others Muscle atrophy in patients with Type 2 Diabetes Mellitus: roles of inflammatory pathways, physical activity and exercise. Exerc Immunol Rev. 2016; 22 : 94-109 . Kim D.H., Yoo K.H., Choi K.S., Choi J., Choi S.Y., Yang S.E., others Gene expression profile of cytokine and growth factor during differentiation of bone marrow-derived mesenchymal stem cell. Cytokine. 2005; 31 (2) : 119-26 . Haynesworth S.E., Baber M.A., Caplan A.I.. Cytokine expression by human marrow-derived mesenchymal progenitor cells in vitro: effects of dexamethasone and IL-1 alpha. J Cell Physiol. 1996; 166 (3) : 585-92 . Phuong Thi-Bich Le, Nguyen Phu-Van Doan, Phan Van Tien, Dang Ngo Chau Hoang, Ngoc Kim Phan, Phuc Van Pham, 2019.